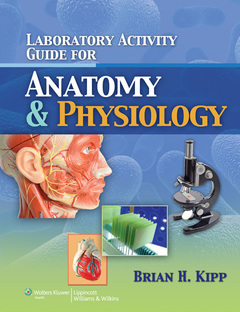 The very first of its kind, Laboratory Activity Guide for Anatomy & Physiology brings anatomy and physiology to life for entry-level students in one short semester. The integration of form with function clicks for students like never before as they apply their classroom knowledge in the laboratory setting. Covering all of the major body systems as well as other essential topics, this all-purpose manual provides 16 labs to give students invaluable hands-on experience and dozens of activity-based exercises to reinforce what they have learned, while building critical lab skills. An introductory chapter covers lab safety to prepare students for this new environment. This exciting First Edition lab manual is concise enough to cover one-semester courses as well as versatile enough to be used alongside any anatomy and physiology textbook. In addition, it doesn’t require obscure, costly equipment—this manual works with the resources found in any lab and instructional tools that can be easily acquired. This unique and democratic approach revolutionizes the way A&P programs can be taught. Students reinforce learning through a variety of exercises and questions, including labeling, short answer, fill-in-the-blank, observation, and definitions. Multiple exercises are included in each lab so instructors have the freedom to select which exercises will work for their curriculum and available lab materials.